Easy to make and inexpensive. Tucked away in our storage we have some Dutch ovens that are built for use on a stove. This means no ring around the top to hold coals and the legs on the bottom are missing. However, these are good US made cast iron Dutch ovens so I wanted to use them with our outdoor cooking setup. 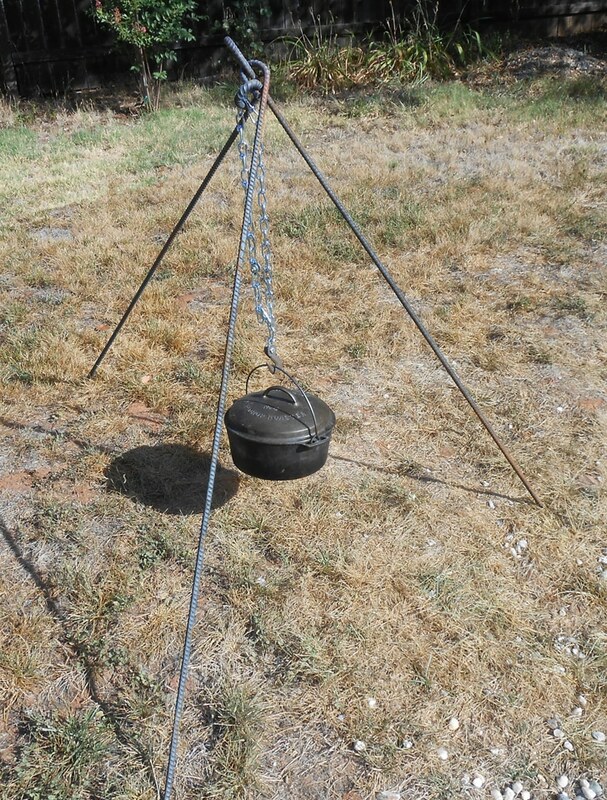 A simple solution was to make a tripod to hold them above the fire. This can be useful for keeping things warm and cooking foods like stews or soups. 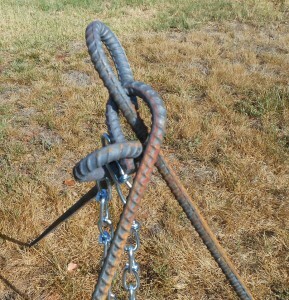 So we took three lengths of ½ inch rebar and built a tripod. It was quite simple. We cut the rebar to the length we desired which was four feet. One end was then heated with a torch and we bent it into a loop. Loops from the other two lengths were then looped through and a little heat and hammering closed the loops. 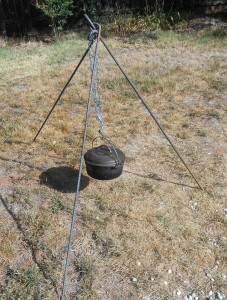 We now had a completed tripod and the only thing left to do was to install a chain and hook. A hook was installed on the one end of the chain. 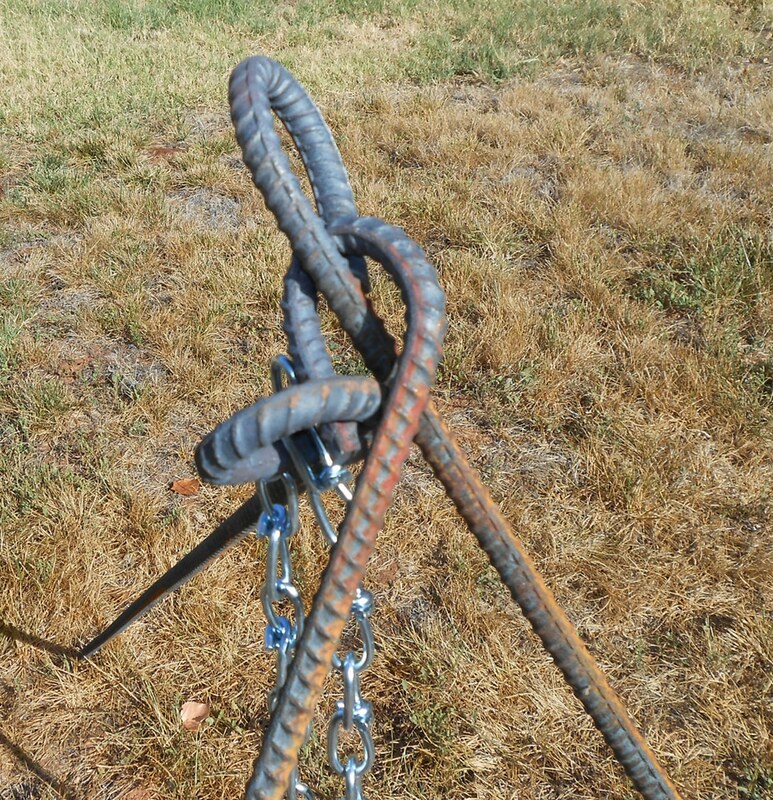 The other end of the chain was ran through the loops and attached back to the chain with a carabiner to allow for adjustment. This makes a nice simple inexpensive tripod that collapses together and takes little room. This entry was posted in cooking, equipment and tagged Dutch Ovens, Howard, tripod. Bookmark the permalink. I’ve made several out of conduit and eye bolts that just fit into it. Open two eye bolts and close them on the unopened one. I used S hooks of the correct size with the chain for adjustment. I even made one set with scrap conduit using the slip together factory joints so the folded length can then be halved. Its a bit more on the wobbly side but it still works. I like these things as its fairly easy to adjust for the temps you want while cooking, we usually use coals from a bigger fire or briquets. I may make a set like you have described here for static use in the yard with a bigger pot. ( 6 dollars ) so I just need to link them. Thanks again. The tripod legs should all be the same length. If I remember correctly the legs were between 4 and 5 feet long. Use the chain to adjust the height of the pot above the fire. Very nice article but if you are like me and have neither tools, skill nor strength to make a set yourself may I recommend Panther Primitives (pantherprimatives.com). Their’s is a Tripod/3 Piece Fire Set. Each piece is 3ft tall. The cost as of this posting is $28 plus you can get a canvas carrying case for an additional $9. I have owned my set for about 20 years. They have very good quality items that have with stood the test of time in my historical re-enactment group. We portray 16th century Scots and have used their tents and other items for many years. No need to heat. Just use the towing ball on your truck to bend the loops. Make sure you leave an opening on each piece so you can make the connections to all three pieces. After you have put the together go back to the towing ball and close up the loops. What a great idea, I will have to try that.